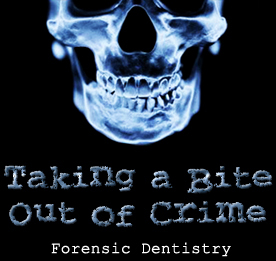 BACKGROUND- Forensic odontology is the study of dental applications in legal proceedings. 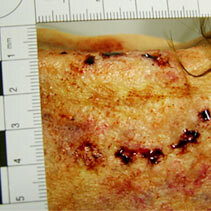 The subject covers a wide variety of topics including individual identification, mass identification, and bite mark analysis. The study of odontology in a legal case can be a piece of incriminating evidence or an aspect of wide controversy. There have been many cases throughout history which have made use of bite marks as evidence. Bite marks are usually seen in cases involving sexual assault, murder, and child abuse and can be a major factor in leading to a conviction. Example picture of a bite mark. How evidence is collected- A woman was murdered by strangulation after being sexually assaulted. She was bitten several times on her nose. Walter Marx was identified as a suspect and dental impressions were made of his teeth. Impressions and photographs were also taken of the woman’s injured nose. These samples along with other models and casts were evaluated using a variety of techniques, including two-dimensional and three-dimensional comparisons, and acetate overlays. Three experts testified that the bite marks on the woman’s nose were indeed made by Marx. The victims of this particular murder were Billy Craig and his father who were both shot by an IRA hitman. The hitman left very little evidence, including a partly-eaten apple and a few empty cartridges with the use of forensic odontology, the apple proved to be an extremely important peice of evidence. By examining the bite marks found in the apple, a professor of orthodontics found that the killer had a deformed jaw. Upon finding this the professor made a prediction about the killers appearance, saying that he or she would have a large nose, a high forehead and a long thin face, they would be tall and thin with a lantern jaw and may also have breathing difficulties. During their investigation the police happened upon a possible supect who was a very close match to the descriptions given by the professor. A cast was taken of the suspects teeth and, when compared to the bite marks in the apple, it was found that there was a nearly impossible chance that any other man had bitten the apple. The IRA hitman was then punished with seven life sentences for his role in the murder of Billy Craig and his father as well as many others.